The Funky Felter: Funky's Stamp of Approval for Felbi Wool Batting by Fibre Fusion at Outback Fibers! Prefelts for surface design, needle felting, and wet feltmaking! 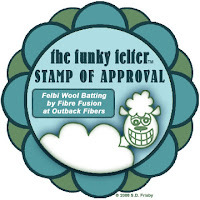 Funky's Stamp of Approval for Felbi Wool Batting by Fibre Fusion at Outback Fibers! Prefelts for surface design, needle felting, and wet feltmaking! A few months ago I came across Felbi Wool Batting by Fibre Fusion on the Outback Fibers website. These are prefelted batts of wool which have been created through needle felting. Each sheet is thin and not meant to stand alone without layering them or putting them on a backing. 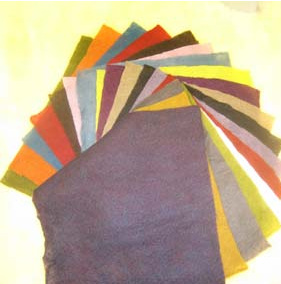 They have been created for feltmakers to use in surface design, needle felting, and wet felting. You can buy it by the yard or in sheets. When I found these prefelts, I was a little skeptical initially as I've always been a die hard traditionalist and made all my own felts from scratch. It almost felt like cheating at first because I was very accustom to creating from the raw wool. The Felbi Wool Batting looked so very interesting though that I convinced myself to buy a sample pack and give it a try. After all, I deduced that it could only cut down my felting preparation time and make the feltmaking process faster and hopefully easier too. Also, the sample pack is rather inexpensive considering all the possibilities for it. After receiving my sampler pack of 21 different colored 10 inch square prefelt sheets, I actually let them sit for a while without even opening them. I think that a part of me still felt guilty for not making all those prefelts myself by hand, but finally I was able to quiet the traditionalist within me and convince myself to use them. When first opening the plastic packaging, I just sorted through all the wonderful, vibrant colored sheets of thin prefelted wool. They are rather wispy and a bit see-through; yet, they seemed to be quite durable and suited for their purpose. Thus far, I've only created with the prefelts a few times, but I have found them to be very useful for adding some artistic flair or surface embellishment to my wet felted projects. The ability to cut out shapes in the prefelts and apply them to my larger felted works has been a real time saver and also allows for greater control in my designs. I've used them to add some specific areas of color to needle felting projects too. When needle felting though, I've found that you really need to layer the prefelt sheets or attach them to a backing of felted wool due to their wispy, thin nature. Overall, I really like the prefelt Felbi Wool Batting. If you want to save time or have more control over your surface design areas, then I'd highly recommend these prefelted sheets. They are worth the investment in a sampler pack to try them out and see for yourself. Eventually I may buy some yardage of certain colors for making scarves, but for now the traditionalist in me roars so I'll stick to creating larger pieces the old-fashioned way with one raw fiber at a time, but I do plan to use my prefelt sampler pack to add a bit of creative surface design! **The image is a screen shot from OutbackFibers.com; Please visit their website directly for ordering information and product details. I am in no way affiliated with Outback Fibers or Fibre Fusion; I just think they have a super neat product. If you'd like to suggest a topic for review, please sroll to the bottom of the page and use my contact form. You can also reach me through email via my website. I am now writing weekly reviews on felting books, supplies, and other feltmaking topics.